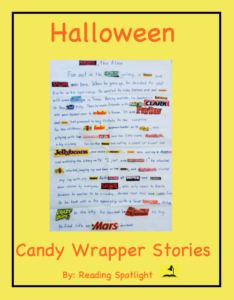 Home » GRADE LEVELS » 2nd Grade » Save Those Halloween Candy Wrappers! These FREE instructions for a really fun composition project are adaptable to many grades (2-8). Students use the wrappers in composing creative stories to hang around your classroom. Impressive! Clear, helpful hints will make this a good experience for busy teachers, too! Some titles might be: BABY RUTH Lost in New YORK, Matt & Mindy (M&M) Soar Through the MILKY WAY, Never SNICKER at NERDS, MIKE & IKE in a SOUR PATCH of Vegetables. Everyone will enjoy both the writing and the reading of the stories!